Simple, cheap and easy to fly. Definitely worth the money. Great for beginners, spare parts included. Very responsive and easy to control - optimal entry-level drone. The Blade Nano QX RTF is small, simple-to-fly drone that is a lot of fun. 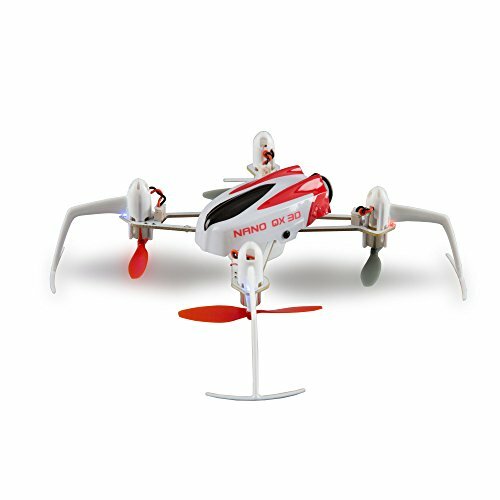 Designed to be used indoors, this cheap mini-quad is stable enough for starters but agile enough for acrobatic flying. The Nano QX has simple design and tough body, so it isn’t likely to break itself or things when it hits something or crashes. This quad is an excellent choice for the beginner pilots who want to get a feel for the complex process of flying a drone. The Blade Nano QX is a ready-to-fly (RTF) drone, so to get it flying, all you have to do is charge and insert the battery. Weighing at only 16 grams the Blade Nano QX is so lightweight that it doesn’t gain a lot of speed when falling out of the air. In an emergency situations you can simply drop throttle all the way and let the copter lightly crash into the ground. Also, Nano QX has amazing built-in prop guards. These allow you to both hit into the ceiling and walls without risking damage to your propellers. The construction is well designed and composed of durable but flexible materials. The drone’s frame is made from a single piece of plastic and a single printed circuit board, but it is tough enough to withstand most crashes. The canopy clips on top, and the battery fits securely beneath it. In addition to the physical features of the drone, the technology and flight controller in this thing makes it even more crash proof.
. If you fly sideways into something, these guards will stop the fast-rotating propeller blades from hitting it, protecting both the blades and the thing you hit. The battery is a small, 150mAh Li-Po pack which provides around 8 minutes of flying time. The battery is recharged with a USB-powered charger. It takes around 25 minutes to completely recharge. It is very easy to replace the batteries – just disconnect the power cable, slide it out from the base of the drone and reverse that to change it. This drone uses a two-stick remote control. It fits nicely in a hand, with the sticks falling naturally under the thumbs. The rudder control (that rotates the quad right and left) is on the right stick and the aileron (that tilts the quad right and left) is on the left. The elevator control (to move right and left) and throttle control (to descend and ascend) can be switched between the up-down of the two sticks. The throttle stick requires very little force to move. The power switch is between these two sticks. It turns the controller on or off, as signalled by a single red LED light. There are also buttons around the ring of the stick which allow you to trim the sticks to adjust their sensitivity. The controller boasts Sensor Assisted Flight Envelope (SAFE) technology. It means that there are more sensors in the Blade Nano QX than your average drone. So there are two flight modes, agility mode and stability mode. The agility mode allows you to do some basic stunt flight, such as flips, rolls etc. The only negative point of this drone is that it doesn’t have an auto-flip feature. Although many flyers can flip this drone, it isn’t a super simple thing to do. It is definitely doable, however for the novice flyer learning it will definitely take a while to get the hang of. The stability mode uses the SAFE technology. The drone will not go past a certain point on the horizon, meaning it won’t allow you to flip or go to an angle that you can’t rapidly recover from. This flight mode will allow you to understand the basics of flight and orientation easily at a small price. In addition, this drone is perfect for the starter because you can have a crash without even worrying about breaking the drone. The remote controller uses four AA batteries. This drone has a rather short battery life, about 8 minutes. That is normal for small quadcopters like this. The small 150mAh battery doesn’t last long, but spares are inexpensive. You can purchase a pack of four for less than $20. The batteries are recharged with the included USB adapter, which normally takes around 25 minutes to fully recharge a battery. , both of which are simple to replace. You don’t need tools to replace these because the rotors pull off the motors easily and the canopy snaps simply into place. You can purchase other parts, but with a low-cost drone like this, purchasing a whole new drone is simpler in the event of a severe crash. The Blade Nano QX is fun to fly. It can turn and climb pretty fast and has a decent speed. It quickly reacts to the controls to offer you the beauty of precise flying, once you get used to the controls. When you first connect the blue LED light on the drone blinks until you put it down on a level surface. This LED light will turn solid blue after the drone detects that it is on the ground and still and you can kick on the throttle to take off. The Blade Nano QX uses this same level detection (SAFE), to try to hover when you are not touching the controls. It works pretty well and if you release the controls, the drone will try to hover. However, if you take your eyes off the drone and let it fly out of your sight, this won’t save you. SAFE can be disabled by pressing down the left stick. However, it is recommended to leave it turned on unless you are an advanced pilot. The included remote control has a range of around 12 meters (40 feet), which is sufficient for a small drone which is designed for indoor flying. However, this drone has its downsides. While its light weight (only 16 g) does make it maneuverable and zippy, it also means that even a slight breeze will send this ultralight drone off course. Hard flying may mean a shorter life for the motors (this is the case with all other brushed drones). So if you want to make certain not to lose flying time you should get yourself a couple spares. You have to plug in the drone on a flat surface in order for the drone to know what level is. He Blade Nano QX is an awesome quad that’s a cinch to fly. It is really amazing how stable a quadcopter of this weight and size is. The battery life is relatively short, but spare batteries are really affordable. In short, the Nano QX is a great first quad for the aspiring pilot who wants to try one out before spending a fortune on an expensive quad. This quad is forgiving of the inevitable crashes and it will allow you to learn the basics.